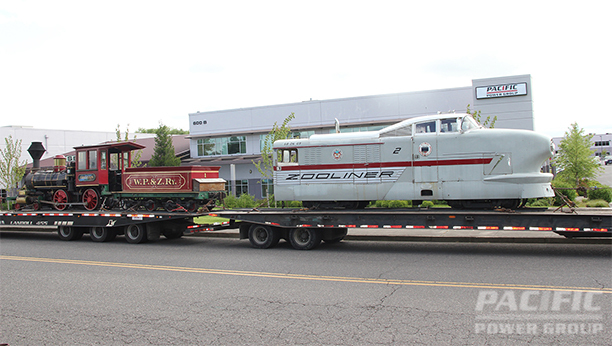 Pacific Power Group moved the Oregon Zoo’s Zooliner train engine and Centennial steam locomotive to its facility in Ridgefield earlier this week in preparation for restoration and upgrades. The PPG industrial engine team will remove the current engine and replace it with a Perkins Tier 4i engine, with advanced emission controls technology designed to reduce exhaust emissions. In addition, Pacific Power Group’s body shop technicians will perform some cosmetic work, including sanding and repainting, on both the Centennial and the Zooliner. PPG’s engine experts will also test the Centennial steam locomotive’s pressure vessel, install a new smoke box, and replace the steel-frame carriage on the locomotive’s tender car.